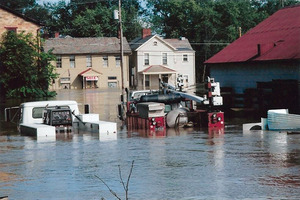 It’s been 10 years since Hurricane Ivan barreled into western Pennsylvania and caused flood waters to engulf the land surrounding the Connoquenessing River, invading the homes and businesses of the tiny historic town of Harmony in Butler County. Another smaller flood hit the already devastated area less than two weeks later. “We had 200-year rainfalls in 10 days,” recalled Rodney Gasch, Historic Harmony board member and chairman of Rise Above the Waters—10 Years After Ivan, a flood commemoration event that will take place in Harmony on Saturday, Sept. 27 from 10 a.m. to 4 p.m.
Back then, most of the creekside homes in the Porters Cove neighborhood off of Hartmann Road had to be evacuated as acres of water covered the land. Many residents and business owners in Harmony were forced to seek shelter elsewhere and faced months of clean-up and rebuilding. “Harmony’s fire chief spent a week-and-a-half pumping out basements and rescuing people,” Gasch said, noting that Grace Church became the central place for residents to seek aid and hot meals. One decade later, the town is looking forward to joyfully celebrating their rise above the devastation with water-themed art, food, music and activities. 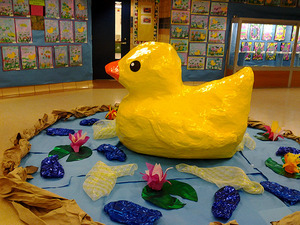 The event will include a kick-off parade featuring a 5-foot high yellow duck created by students from Connoquenessing Valley Elementary School. M. J. McCurdy, owner of Bottlebrush Gallery on Main Street, wasn’t around for the flood, but she’s been instrumental in bringing even more art into Harmony to commemorate the event. “M.J. is providing an installation art piece that we’ll put on the square, and she is organizing some other outdoor sculptures, including those of en plein air artists who will create their masterpieces ‘in the open air,’” said Gasch.